LARGO is a single, grand lamp. In this version it can be used as a sole light source to illuminate an interior. 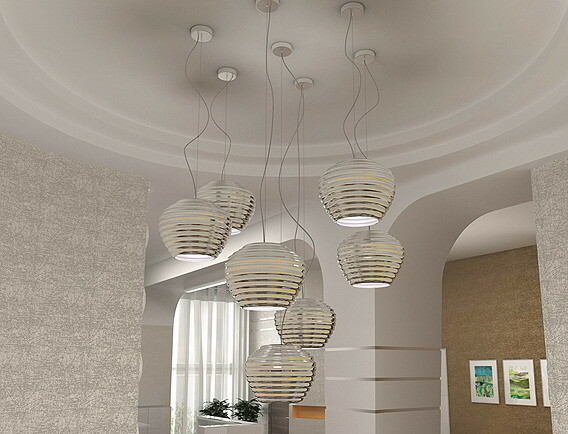 Its impressive, hand made lampshade will provide a strong accent to any interior design. To illuminate larger interiors, we recommend using a few, individually placed LARGO lamps. There are seven colour variants of this model. Lamps in the metallic and black version provide a moody, delicate light directed downwards, with a slight glow within the lampshade. The power of single lamp is 10W (apprx. 75W incandescent light equivalent).